On Monday June 21st, the Ontario Trial Lawyers Association(OTLA) in conjunction with the Brain Injury Association of Peel and Halton(BIAPH) held a Helmets for Kids Campaign at the Halton Children’s Safety Village to bring helmets to kids in need. Local Halton personal injury lawyers donated funds to purchase 170 helmets for kids who otherwise would not have one. Laura Hillyer, Martin & Hillyer, coordinated the event, the first of it’s kind in the Halton Region. Children from McKenzie Smith Bennett School in Acton were taken on a trip to the Halton Children’s Safety Village in Oakville, where they received bike safety instruction from Cindy Lawrence of the Safety Village. All the children were then individually fitted for a brand new bike helmet. Thanks to the volunteers from Martin & Hillyer, OTLA and the Halton Police co-op student program. 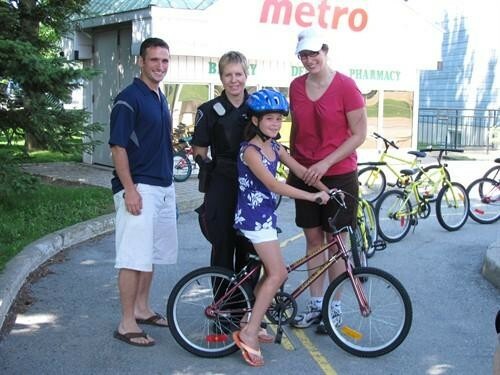 Below is a photo with a student from MSB along with (from left to right): Mr. Baker (Grade 3 teacher), Officer Barnett (Halton Police), and Laura Hillyer (Martin & Hillyer). the helmet should cover the top of the forehead and should rest about 2 fingers’ width above the eyebrows. Article regarding this event posted on Inside Halton.com, click here.